Over the years, we’ve seen a whole lot of innovation in computing. Faster processors, smaller form factors, touch-screen inputs and wireless data. All of these have had a profound impact on how and where we use technology. And as important as all of these advances have been, nothing has changed our fundamental relationship to these devices as much as improvements to their displays. Displays are at the heart of how we perceive–and ultimately use—all of our computers, be it the biggest, most powerful desktop or the smallest of smartwatches. It’s the reason that new display technology always leaves me saying “wow.” That was my reaction when I saw my first high-res graphics monitor, when I saw my first colour LCD display and most recently, when I looked upon Apple’s Retina-equipped iPad. These technologies really enhance our use and enjoyment of computers. 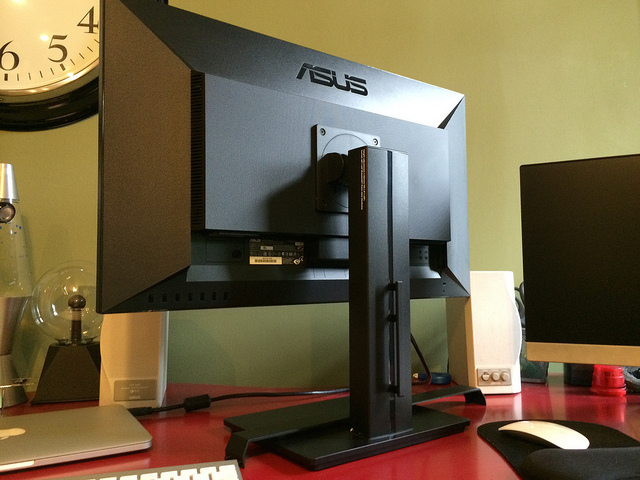 So when I was offered the chance to try out ASUS’s PB287Q, one of the first reasonably priced 4K displays on the market, I jumped at the chance. Unless you’ve been hiding under a rock (or simply not reading Canadian Reviewer) you’re probably aware that curved screens are all the rage. First it was TVs, with both LG and Samsung debuting curved OLED and LCD HDTVs and UHDTVs. The rationale being that a curved screen offers viewers better picture quality because it eliminates edge-distortion caused by the increased distance of the sides of the screen to your eye. Yeah, I’m not necessarily buying that reason either, but one thing’s for sure: Curved screens are here and starting with the LG G Flex, they’re going to be in your hand, not just your living room. 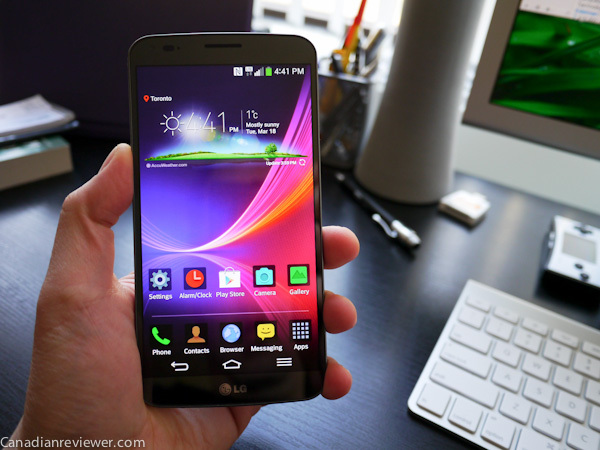 So the question is, why do we need a curved smartphone? If there’s one thing that nearly every smartphone and tablet has in common, it’s this: dreadful sound quality from the built-in speakers. Yes, I know some possess stereo speakers, and there’s certainly a case to be made that when privately watching a video on an iPad in a quiet room, the sound is sufficient enough to be enjoyed. But the bottom line for speakers is similar to the bottom line for car engines: there’s just no substitute for cubic inches (er, centimetres). So it’s no wonder that in recent months a whole new category of products has emerged to help consumers with their tiny (and tinny) device speakers. We are now living in the age of Bluetooth Hi-Fi and there are several ways you can use this wireless technology to amp up the performance of your favourite media gadget. The first is by using a Bluetooth gateway device like the BlackBerry Music Gateway – a diminutive black box that simply relays the audio signal from your phone or tablet to the system of your choice. It’s simple, cheap ($49) and effective. But it’s not portable (you’ll still need to plug it in) and it’s a one-trick pony. Streaming audio is all it does. The second option is one of the large Bluetooth-capable speaker systems like the Parrot Zikmu. It’s gorgeous, and likely has sound that compares to many high end speakers, but again portability is not really a strength and they don’t come cheap – a pair will run you $1599. Finally, there are the truly portable, battery powered units that are small enough to fit in nearly any travel bag, yet big enough to deliver much better sound than your built-in speakers. The Braven 600 is one of these products, and at $149 it’s the perfect compromise between the trio of considerations: price/performance/portability. The first thing the Braven 600 reminded me of (and I’m dating myself here) is the speaker in Bosley’s office that Charlie used to speak with his Angels in the hit 70s TV show, Charlie’s Angels. The Braven’s all-aluminum wrap-around body is perforated by small holes on both sides, much like the speaker Charlie Townsend’s voice emanated from. The similarity might not be entirely in the mind of this writer – the Braven 600 is in fact a speaker phone as well as being a wireless stereo speaker. The elegant design lends itself just as well to a boardroom table as it does to a living room, or anywhere else for that matter. Braven claims that the 600’s battery life is good for about 12 hours of streaming which should be more than enough for times when you’ll need it to be fully unplugged. The battery life is so good, the Braven can also be used as an auxiliary power source for your phone, or any other gadget that be recharged via conventional USB. The company suggests that an average smartphone could get back up to about 70% from empty. Not a bad trick. Side views of the Braven 600. Note the presence of a full-size USB port and an audio out mini-jack. As if that weren’t enough, the Braven has one more trick up its sleeve. Remember how the BlackBerry Music Gateway can let you stream music from your device to any piece of audio equipment you own? Surprise: the Braven 600 can do that too, thanks to its audio output jack – a feature that may well be unique in this category. So how does it sounds? Well, I’m not gonna lie – it’s not going to replace your home theatre system. But it does sound very good for such a small speaker. My experience was that it favoured “brightness” and clarity over low-end bass, but not to a degree that it sounded flat or tinny. Interestingly, vocals seemed to be it’s strong suit, again perhaps not a surprise given its second life as a speaker phone. But what good is listening to a speaker like the Braven 600 without a point of comparison? Sadly, I didn’t have the Braven’s closest competitor, the Jawbone JamBox to do a side-by-side comparison. So I did the next best thing and hit up YouTube. Sure enough, I found this video from Gear Diary which, while not the ideal way to audition speakers, at least gives one the rough idea. Clearly the Braven more than holds its own when put up against the more expensive and less fully-featured JamBox. The Braven comes packaged in large, clear acrylic display case which is not recyclable (not cool Braven), but includes an AC-to-USB power block (which looks like a black version of the one that comes with iPhones) plus a USB cable and a short stereo audio cable for 3.5mm jacks. They even throw in a small cloth carrying case. The Braven isn’t exactly a bargain; I know that for some folks the idea of spending $150 on a wireless speaker still seems like too much. Plus you could probably cobble together a decent sounding system using other components for less. But when you factor in all of the Braven’s capabilities, you’d be hard-pressed to find its equivalent at any price. If you’re interested in a Braven speaker (they make two others in the series) you won’t be able to find them in any Canadian retailers yet, but you can buy them direct from Braven and they will ship to Canadian addresses. I’ve never driven a Porsche 911 and I’ve certainly never reviewed one. But I imagine that getting your hands on the latest 911 is a little like getting your hands on a new iPhone. Apple’s iPhone is their 911. It’s the one product the company makes that has wowed journalists and buyers alike for what seems like (at least in tech terms) forever. And just like Porsche, Apple has methodically rolled out changes with each new model that improve on the previous device while staying true to the core elements that have made the iPhone the most iconic device in consumer technology. The iPhone 5 – which is actually the 6th generation of the iPhone – does just that. I’ve been using the iPhone 5 as my daily smartphone for one month, and everyone who has spotted me with the device has wanted to know what I think. The answer is simple: It’s a great device. But let’s put that assessment in context. Prior to getting the iPhone 5, I had been using an iPhone 4S for about a year, and the iPhone 4 before that. So for me, that sense of incremental improvement is particularly acute. The iPhone 5 is a great device, because it improves on a series of smartphones that were already great devices. If you’ve owned an iPhone in the past, the latest version will feel completely familiar – almost eerily so. I can’t think of another player in the smartphone market, with the possible exception of RIM’s BlackBerry, which has stuck so strictly to its original form factor and user experience. Even if you were to upgrade from the very first iPhone, you would be comfortable with the 5 within, well, 5 minutes. In Apple’s own way (which is to say somewhat grudgingly) they have acknowledged that there is a benefit to be had with a larger screen. But also, true to their vision, they only increased the height of the iPhone 5’s screen, not the width. This means you get one extra row of icons on every screen and apps have a slightly larger canvas on which they can get clever with interactivity. But in practice, you get used to this larger screen instantly – you don’t even realize the extra room is there. Perhaps that was the idea. And even though much fanfare was made about this change when Apple announced it, I don’t think it’s reason enough to buy the iPhone 5. The reason is that none of the benefits of the large-screen phones such as the Samsung Galaxy S III or the HTC One X are present on the iPhone 5. Those other phones actually increased the relative size of objects on the screen, by making *both* dimensions of the screen larger. You get more room for web pages and the text is larger and therefore easier to read. Since Apple kept all of the proportions the same, but added a bit of extra scrolling room, nothing appears “bigger”. If Apple can lay claim to one undisputed title, it would be for industrial design. There is nothing like the iPhone 5 on the market that approaches its simplicity and elegance. It’s a delight to hold. If thinner and lighter are qualities you appreciate, you’ll love this phone. But there is a natural ergonomic price to be paid when you go this thin. It gets a little harder to hold securely. With previous models, gripping the phone meant that your thumb naturally rested on the side unless you were using it to tap in a phone number or trying to text one-handed. But with the iPhone 5’s rail-thin design, there is a tendency even for someone with relatively small hands like myself, for the thumb to roll forward onto the front edge, rather than sit squarely on the side. Having less surface area in contact with your skin means poorer overall grip. I have a feeling that this iPhone will not only break sales records, but also set new records for the number of times it gets dropped. But that might not result in the tragedy so often associated with dropping an iPhone 4 or 4S. Those models were clad in glass on the front and back, whereas the iPhone 5 uses mostly aluminium on the back panel. It may get scuffed, but it is far less likely to break, and of course shattering is highly unlikely. Only time will tell if the 5 proves more durable than its glass-jawed predecessors, but it seems like a good bet. What happens when a company changes a connection that has been standard on all of their devices for 10 years? You get a lot of frustrated users. There’s no kind way to say it: By adopting the new Lightning connector which graces all of Apple’s new products, they have made every existing accessory that depended on the older 30-pin connector, obsolete. Unless that is, you opt for the $35 Lightning-to-30-Pin Adapter, which as of the writing of this article, was still unavailable for testing. Even with the adapter, it’s unclear whether older accessories like alarm clocks with built-in docks will be as functional. I can only imagine the stress that your 30-pin dock will have to endure with the added leverage of the adapter plugged in and moved around daily. That said, the Lightning connector is a *very* nice design. It’s small, sturdy, clicks into place with a decidedly satisfying popping sound and is reversible which means no more looking to see which way the plug is facing. Would everyone have preferred an existing standard like MicroUSB? Sure, but that’s not how Apple rolls. Surprisingly, the most controversial feature of the new iPhone wasn’t a feature of the phone itself. Instead, it was what Apple had done to iOS6 – the latest version of iOS that runs all of Apple’s mobile products. With iOS 6 getting its debut alongside the iPhone 5, it was the first time consumers had a chance to play with the more than 200 new features Apple had introduced. But not all of the 200 changes were additions. Some were removals of features. The popular Maps app which had always been powered by Google’s excellent mapping data, got ditched in favour of Apple’s own proprietary mapping product – a move that resulted in one of the rarest events in the tech world: Apple’s CEO apologizing for the quality of their product and actually suggesting alternative apps in the short term. I can’t claim to have made an exhaustive study of the new Maps app – others have already done that. Suffice it to say there are good parts (fast rendering, free turn-by-turn navigation, 3D view of major urban areas) and bad parts (inaccurate driving directions, old data, no more Google Street View). Maps wasn’t the only shocking change. Gone too was the native YouTube app. This was the more puzzling of the two Google-related changes. With Maps, you could see that Apple wanted to stop working with Google and start promoting their own product. But Apple doesn’t own and, as far as we know, has no plans to compete with Google’s video behemoth YouTube. So why Apple chose to remove the handy YouTube app remains a mystery. Functionally speaking, the change has been mostly mitigated by Google – the YouTube website which the Safari browser takes you to when you choose to watch a video – does an excellent job of creating a mobile-friendly interface. It’s still not quite as clean as the native app, but it’s surprisingly good all things considered. Plus, if you simply want to browse YouTube, Google has released their own standalone iOS app, which works well. Of course iOS 6 brings lots of other great features such as panoramic photos, enhanced Siri capabilities, integrated sharing via Facebook and Twitter and Personal Photo Streams (to name just a few). There’s certainly lots to like about this update. The iPhone 5 is the first iPhone that comes equipped with the latest standard in high-speed mobile data known as 4G/LTE. In theory, you should be able to get download speeds up to 75mbps and uploads of up to 25. In practice, it’s usually less, but it’s still amazingly fast – usually faster than the connection you have at home. But finding an LTE signal can be tricky. Coverage can be spotty, even in areas that show as being covered on your carrier’s map. But perhaps more importantly, is the toll that LTE takes on battery life. In my semi-scientific comparison, I found that using LTE reduced battery life by about 10%. That’s not awful, but if you’re the kind of person who finds they can barely get through a day on a single charge, you might want to leave LTE turned off until you absolutely need the extra speed for a specific task. Yep, that’s the name that Apple has given its newly-redesigned ear-buds. They’re still white. They still have that handy in-line remote with microphone, but now they possess a distinctly bulbous look which lets them sit just a little more securely in your ear. They do not provide much in the way of sound isolation, and despite Apple’s claims that they have figured out a way to coax $100 sound out of $30 ear-buds, I found that I could barely detect a difference when I tested the new EarPods against the previous design. They sound a bit better, but I’m hesitant to even say they’re 10% better than the older design. It’s hardly a deal-breaker. After all, the old ear-buds weren’t shunned by users – I still see their hallmark white cables on tons of people every day. What is a bit odd is the carrying case that Apple thoughtfully included with the EarPods. Odd in the sense that it is not a very friendly piece of plastic. The combination of having to seat the EarPods just so in the case’s contours and needing to wrap the cables so that the in-line remote end up in its allotted groove, and well, it’s a bit frustrating. If you’re of the opinion that iPhones are just for the feeble-minded followers of the cult-o-Apple, the iPhone 5 isn’t going to change your mind. Quite the opposite. Because it embodies all of the attributes that have made the iPhone the enormous success that it is – and then some – you will not want this latest version either. For you, may I recommend the Samsung Galaxy S III. But if you like the way Apple has carved out its approach to the mobile space, the ease-of-use that pervades all of the company’s products or just the envy-inducing design of the iPhone 5, I can wholeheartedly say you won’t be disappointed. Now might just be the worst time in the year to be making a buying decision when it comes to tablets. Not only do we have more choice than ever when it comes to these devices, but those choices seem to be expanding daily. A few months ago Google launched its first tablet, the Nexus 7, a 7-inch model made by ASUS, for the extremely competitive price of $229 – less than half the price of an iPad. Yesterday, Microsoft revealed its pricing on the new line of Windows 8 RT devices known as “Surface.” At $499 it too is cheaper than the iPad, albeit not by much, but has a much larger screen and vastly expanded support for external peripherals and memory. Plus, it’s a virtual guarantee that tomorrow, Apple will be launching its own line of smaller iPads, rumoured to be called the “iPad Mini” with price range between $250-$350. All of this creates an environment where consumers will be able to choose not only three different mobile operating systems (iOS, Android, Windows 8) but several excellent choices when it comes to the hardware that these operating systems run on. It’s into this incredibly packed and competitive market that Canadian company Hipstreet hopes to sell its 10.1″ Android tablet, the Equinox 2. Not a bad set of specifications. At first glance, with the exception of built-in memory, it appears to offer much more tablet for the buck than the similarly priced Google Nexus 7. But specs can be deceiving – especially when it comes to portable devices. Tablets, smartphones, portable gaming systems – even laptops – get handled a lot and our tactile experience with these products depends heavily on their use of materials and build quality. This is where the Equinox 2 hits a fairly significant snag. – The back panel is made of plastic. And not the kind of grippy plastic that you might find on the Nexus 7 or even a BlackBerry PlayBook. Instead, it has a glossy black finish which is both smooth and oddly tacky to the touch. When you first look at it, it has a kind of high-end piano-like sheen to it, but within minutes of handling it, that sheen is replaced with a mess of finger prints, smudges and dust particles. The material acts like a Swiffer for dirt. So while many devices use plastic as all or part of their exteriors, not all plastics are equal. – The Equinox 2’s edges are flat, but become bevelled where they meet the screen’s surface. At both the flat-to-bevel and bevel-to-screen transitions, there are hard ridges that feel uncomfortable in the hand after a while – it’s a small thing, but given that HipStreet encourages Equinox 2 owners to use it as an e-reader, you would expect a device that feels great to hold for longer periods. – The screen surface is also plastic. Unlike the back and sides of a tablet, which can be successfully designed with plastic, a touchscreen’s surface has to possess certain qualities: Effortless finger glides for the hundreds of taps and swipes you’ll be performing; an even surface so that distortion is kept to a minimum; static-free – even though finger smudges are unavoidable, extra dust and dirt particles are not. The Equinox 2 misses the mark on all fronts. The surface itself is riddled with small undulations – mostly toward the edges but a few creep into the main viewing area. As a material, high-quality glass alleviates all of these concerns, whereas cheap plastic makes them worse. How much worse? The resistance I feel while dragging my fingers across the Equinox’s screen surface is significant. If you’d never tried a device like the iPad or PlayBook, you might be forgiven for thinking that this was normal for a touch-screen. It isn’t. Even the surface of my decidedly dusty computer desk proved to be smoother for finger-dragging. And when you combine the friction of the surface with the hit-and-miss nature of the screen’s responsiveness to taps, the effort of interacting with the Equinox 2 becomes truly annoying. A very noticeable light leak appears in the lower-left corner of the Equinox 2. Turn the Equinox 2 on, and further evidence of poor design and build quality present themselves. With the tablet lying on its back on a smooth surface like a tabletop, even slight pressure against the device’s bezel caused the screen to distort in a roughly thumb-print sized area just above the middle of the screen. You could see this when tapping almost anywhere on tablet’s screen or even on the back panel. The screen also exhibits moderate-to-bad light leakage on the lower left side of the screen, where the gap between the plastic touch panel and the LCD beneath it is particularly noticeable. At 10.1″, the Equinox 2 offers plenty of size, but the low resolution of 1024×600 means the pixel density is very low, resulting in graphics and text that are rougher around the edges and harder to read than tablets with the same resolution but with smaller screen sizes. Despite the tablet’s ideal movie ratio of 16×9, the resolution isn’t sufficient to deliver all of the detail in a 720p HD video. If you want to see videos in their native format, you’ll have to use the HDMI port. My gripes about the Equinox 2’s design and build quality aside, the tablet does have some strengths. The inclusion of USB ports that support not only the connection of the tablet to a PC for content transfers, but also the other way around – to read and write data from accessories like thumb drives and portable hard drives, is a great feature often only found on tablets that cost twice as much as the Equinox. Likewise, having an HDMI port is handy for those who want to watch videos on the big screen. 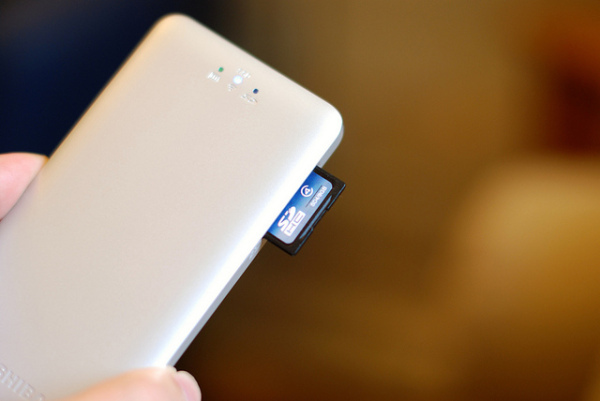 The ability to expand memory via MicroSD cards is also a plus, though frankly given the Equinox 2’s paltry 4GB of on-board storage, popping in an 8 or 16GB MicroSD card is practically a requirement to enjoy this device. The Equinox 2 boasts more ports than the average tablet, including a USB Host port. But these features are only of real benefit to the user if you have great apps and other content to run on the Equinox, which brings me to my next major reservation with HipStreet’s latest tablet. It runs Android 4.0 (Ice Cream Sandwich), which in my opinion is the first version of Google’s OS that gives Apple’s iOS a serious run for the money. Apps open quickly, and transitions are managed smoothly. Switching between open apps is a snap, and the included Dolphin browser is serviceable if not super-speedy. The Equinox 2 runs ICS well enough, but there’s a catch. Not all Android tablets and smartphones are the same. Well, they’re the same in principal – Google makes the base Android OS free to use by any company on any device – but if you want the full Android experience, you need to buy a device that has been certified by Google as “Compatible“. In other words, a device that has passed Google’s test to ensure that all 3rd party apps written for the Android OS will work, and one which is eligible to run Google’s own native apps such as Chrome, YouTube and Maps. Moreover, a device must be compatible if it is to provide access to the Google Play Store – which the primary source of downloadable apps for Android. Hipstreet’s Equinox 2 appears to be amongst the group of Android devices that is *not* compatible, and that’s a big catch. The result is that not only are Google’s most popular apps missing from the Equinox 2, there’s no way to get them because the device doesn’t have access to the Play Store. Instead, the tablet ships with a different app store, known as GetJar. GetJar is a universal app store of sorts in that it isn’t built for any one operating system. Instead it caters to them all. But GetJar is by no means a substitute for the Play Store. Only free apps are available from GetJar, and while the store attempts to ensure compatibility of the apps with your device, it’s not as reliable as the Play Store. Some popular apps can be found on GetJar. I downloaded and installed Skype, Angry Birds and the Kobo ereader apps which all work just fine on the Equinox. But there are no YouTube or Google Maps apps, and many popular free apps for compatible Android devices are missing like Amazon’s free Kindle app, or even Facebook. When you combine the Equinox’s unfortunate build quality with its lack of decent native apps or the ability to access the Google Play Store, you end up with a tablet that simply can’t compete with other products in this category, despite its attractive price. It pains me to reach such a negative conclusion on a Canadian product, but I wouldn’t be doing you the reader, or Hipstreet, any favours by candy-coating my impressions. If you’re in the market for a tablet, you’re on a budget and want to shop Canadian, I highly recommend RIM’s BlackBerry PlayBook. For $129, you can pick up a 16GB model which will blow away any 7″ tablet dollar-for-dollar and many larger ones too. And while the PlayBook still lacks the kind of app support you can find on either iOS or fully-compatible Android devices, the app store is still growing and may see an additional shot in the arm once RIM releases its BB 10 models in the new year. If after reading this, you’re still interested in the Hipstreet Equinox 2, you can find it at The Source and Staples stores, where prices range between $179.99 and $229.